Salivary gland - Atrophy in a male F344/N rat from a chronic study. There is a decrease in the number and size of the glands and an increase in the connective tissue. Salivary gland - Atrophy in a male F344/N rat from a chronic study (higher magnification of Figure 1). There is a decrease in the number and size of the glands and an increase in the connective tissue. Atrophy of the salivary glands ( Figure 1 and Figure 2 ) occurs commonly in older F344/N rats. As is the case with many other glandular organs, the size of the secretory glands is responsive to functional demand and is subject to age-related changes. In aging rats, the number and epithelial height of granular (convoluted) ducts and the number of mature secretory granules have been shown to decrease with age. There may be a slight increase in stromal fibrous connective tissue, and there may be an infiltrate of chronic inflammatory cells. Focal aggregates of adipocytes are sometimes seen between lobules and acini, similar to involutional changes in the pancreas and thymus. 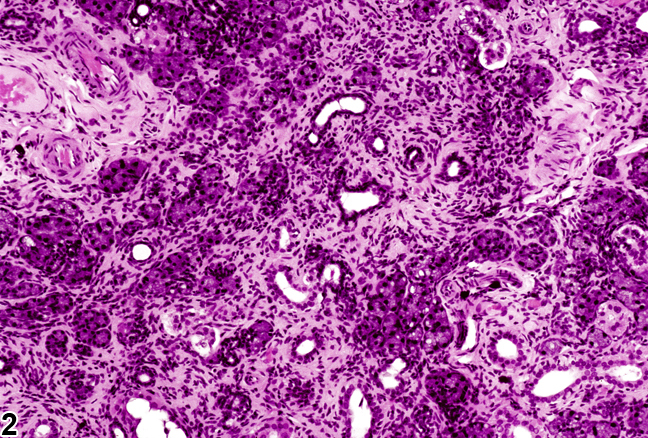 Necrosis of a few individual acinar cells may also be present. Age-associated atrophic or degenerative changes similar to those in the F344 rat are seen in other strains of rats. Atrophy may be the result of toxicity, but it is commonly seen in association with neoplasia or inflammatory lesions in the salivary gland. 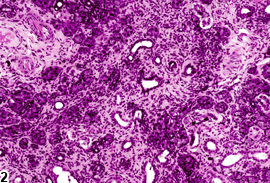 Atrophy can be subtle and can be overlooked when the decrease in cell size is diffuse. Atrophy, necrosis, and inflammation are typically seen with active sialodacryoadenitis virus infection. Atrophy is also seen with mononuclear cell leukemia infiltration of the salivary gland or local invasion by a schwannoma arising in branches of the facial nerve. Mineralization of material in the ductular lumen occurs infrequently and may be seen with atrophy. Denervation, adrenergic antagonists, duct ligation, or liquid diets can result in salivary gland atrophy. Dietary factors influence salivary gland size. Decreased food consumption or protein starvation can reduce the weight of salivary glands in rats. Shrinking of mucous and serous glands and loss of zymogen granules are associated with decreased RNA but unchanged DNA content, attributable to the reduced requirements for protein synthesis. As salivary gland function is responsive to adrenergic stimulation, it is not surprising that atrophy occurs following adrenergic blockage. The weights of the submandibular gland in mice were shown to decrease after administration of the B-adrenergic blocking agent propranolol. 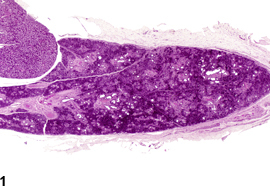 This was associated with a reduction in stainable neutral mucins and a decrease in the thickness of the acinar cells, making the gland lumens appear larger than normal. Salivary gland atrophy occurs occasionally in aging B6C3F1 mice. The atrophy generally affects individual lobules and is characterized by a decrease in the size of acini and acinar epithelial cells, which may be accompanied by an infiltrate of chronic inflammatory cells and an increase in interstitial connective tissue and/or in the number of glandular ducts. The submandibular and parotid glands tend to be involved more commonly than the sublingual gland. Whenever present, atrophy should be diagnosed and graded based on the degree of ductal/acinar cell atrophy and the extent of involvement within the salivary gland. Inflammation and fibrosis associated with age related atrophy are not diagnosed separately unless warranted by severity. Boyd EM, Cehn CP, Muis LF. 1970. Resistance to starvation in albino rats fed from weaning on diets containing from 0 to 81% of protein as casein. Growth 23:99-112. McBride, Harper RK, Siegel IA. 1987. Methotrexate-induced changes in rat parotid and submandibular gland function. J Dental Res 66: 1445-1448. Smith B, Butler M. 1978. The effects of long-term propranolol on the salivary glands and intestinal mucosa of the mouse. J Pathol 124:185-187.